YachtBedding.com always loves to make custom boat bedding for Cruisers Yachts. They are so pretty and easy to work with as far as colors and space. Cruisers does a great job with their interiors keeping the colors neutral yet modern, which allows the clients a lot of freedom in their color and design choices. 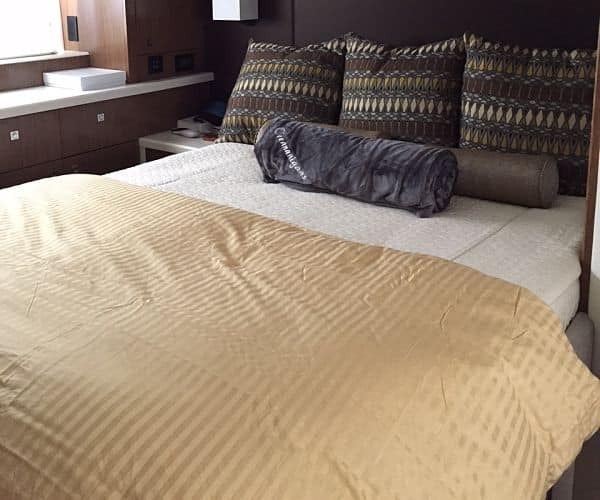 The master stateroom on this Cruisers Cantius 45 is spacious and very easy to make the bed. This client opted for our custom duvet cover and down alternative duvet since that is what they are used to at home. 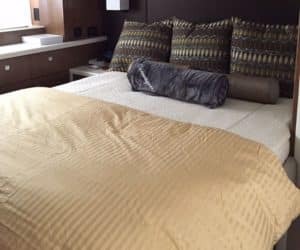 We are firm believers that your custom boat bedding should be as comfortable as your bed at home, so whether you are looking for a cozy duvet, a tailored bedspread or wonderful fitting custom boat sheets, we have you covered!